We’ve all had those days when you’re sitting in your office and your bff calls asking you to meet her for a drink after work, or you’ve had such a crappy day that a nearby happy hour with the girls sounds like just the fix or sometimes you have plans to meet up with your significant other for a weeknight date night. Whether it’s scheduled or on a whim, it’s always great to be prepared with a stylish outfit that can take you from work to the bar. Spring has sprung and after work get-togethers are going to be picking up (come on patio weather! ), so here are 10 awesome pieces that will have you looking stellar during and after work hours. All Saints Peony Top, $158. 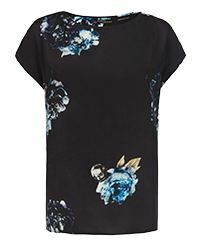 Nothing says spring like pretty flowers, so why not get in the mood with this pretty peony print top. Pair with a colored bottom – try lavender, blue (light, dark – a variety of hues would work here), green, or even a rich red – for the office and for the bar change into a pair of serious skinny jeans or leather pants that you packed with you to work. For shoes, keep it simple with classic pointed toe pumps, peep toe heels or a great pair of flats because all three will get you through your day look and night. Before you head out pile on the jewelry and swipe on a luscious lip color and you’re ready to close up shop and let loose with your friends. Banana Republic Ivory Belted Dress, $140. This may be a little nerve wracking, but if you’re down to wear white at work all day then this is a great dress to invest in. Perfect for the office – professional, sleek, and not overly dressed up – you can rock this look as is or layer under a pretty colored cardigan, printed blazer, or even a great tuxedo-style vest. When you’re ready to hit happy hour, swap out the belt for something a little bolder – try something with metallic accents or a bold color, keep the cover-up or swap out for something edgier like a leather vest, give your lashes a couple sweeps of mascara and you’ll own any place you step foot into. Sabine Scalloped Lace Skirt, $64. Yes, more white. But how darling is this skirt?! The great thing about this is that you really don’t have to do anything to take you from the office to the afterhours fun. Pair this pretty piece with a colorblocked pastel top, try a cute chambray (there’s a great option further down in this article) or a bold printed spring sweater, some feminine sandals and loads of hardware and you’re ready for work and play. Club Monaco Baker Blazer, $239. 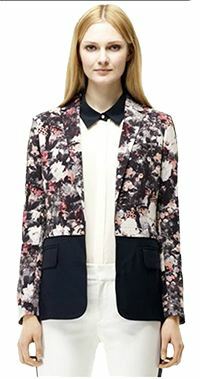 I’m loving this blocked floral print blazer for spring. There’s a great mix of classic and fun and this is one piece that will get you out of the office and to your favorite happy hour with style. Pair this with white or navy trousers while mixing in a pretty pastel salmon/pink top, or mix it up and rock the colored trouser and keep the top basic. Also try pairing with a pretty lace skirt or pants for a touch of girly. 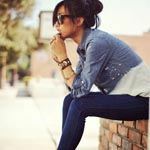 You can continue your office look into evening or swap out your bottom for your favorite pair of jeans or, when the weather is warmer, a great pair of high-waisted shorts. Pair with some platform sandals and you’re ready to take on the office and the town. 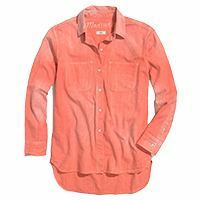 Madewell Perfect Chambray Ex-Boyfriend Shirt in Sunset, $66.50. A great chambray top is one of my favorite things. I love how it easily mixes in with just about everything in your closet and it can tone down your more dressed up pieces for a more casual look. Blue chambray tops are fantastic, but why not change it up for spring with a great new color. This salmon-y/’flame’ top is a great punch of color for spring and will look great with your favorite work looks. Rock with a classic navy or black pencil skirt, pair with some side striped trousers, or any printed bottom for a bold work look and try layering under sweaters, cardigans, and blazers. Chambray is versatile and can work with a lot, so have fun playing around with it and incorporate it into a variety of looks. Transition your office look into night or you can always swap out your day bottoms for some dark denim, flats, and some stacked bangles for a comfortable, stylish, casual happy hour look. BCBGeneration ‘Izzie’ Pump, $59.60 (on sale). A great shoe can really take the simplest of looks to the next level, which is only more reason to buy some new spring shoes to add to your collection. Wear these to add a twist to a neutral or all white look or get bold and try mixing in with other colors and prints for a fun springtime look. These shoes will work anytime, anywhere so you don’t have much to worry about in terms of what to wear with these at the office and heading out for a bite and some drinks. Alice + Olivia Extra Long Wide Leg Floral Pants, $297. I will start by saying that I crave these pants. I love a great wide leg and these are everything and more. The flirty spring print, the flowing georgette fabric, and the confusion and surprise when you realize that this isn’t a skirt but a pair of pants – purely feminine and absolutely amazing. You can style like they do in the image with a feminine pastel blouse, or try adding a masculine touch with a really great crisp white button down or even a basic t-shirt. You can add layers or go basic with just a top and these bottoms – you can pretty much do anything with these pants. My only tip is to keep the top more fitted since the bottom is so flowing. For the bar, if you’re office look seems like too much for your local watering hole, swap in a great graphic tee and moto-jacket or denim vest, a statement necklace or earrings, and a bold lip color and you’re ready to let loose with a more toned down look. Finish either look off with a great pair of stacked or VERY HIGH heel to give some height to all that fabric and you’re ready to take on the world, in incredible enviable pants. 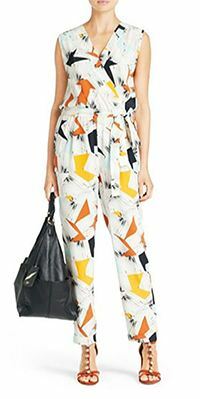 Diane von Furstenberg Kawena Jumpsuit, $465. Feeling bold for spring? Then you need this jumpsuit. I love the classic DVF wrap detail of it mixed with the funky print. It looks incredibly comfortable, its super versatile and you get a mix of color without having to do a thing but wear it. Layer under a blue jacket, or if you’re feeling bold a yellow or mustard colored top layer, add some layered long gold chains and some stackable rings, and some basic neutral heels for day. To add a little spice to the look for the evening, try changing out the removable matching belt and add one of your own – something with a metallic or pastel touch would be great and try to keep it around medium thickness so it stands out but doesn’t overpower – and add some funky open-toe booties or a bold pair of heels and you’ve got yourself a killer out-of-office look. 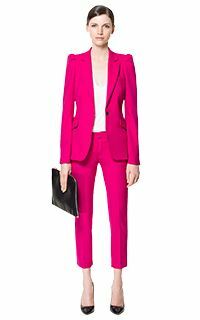 Zara Blazer with Puffed Shoulders + Cool Wool Trousers, $159.80 (for set, but also sold separately)This year’s spring season brings some fantastic suiting with it – bright colors and fun prints are now a major trend in a classic work style. To give this season’s major trend a go, try something like this Zara fuchsia suit. Pair this look with a neutral top (a nautical print short sleeved sweater would look amazing) or get bold with prints, color, and texture (a pretty pastel salmon or pink would create some great colorblocking). For evening, make this look a little more casual with a simple graphic tee and a statement necklace or you can even try a crop top to really edge it up. Loafers will look killer with this suit, but if you’re afraid it’s you’re getting eaten up by too much color, elongating your legs with a great heel will spread it out a little more. Ted Baker Attavia Summer Bloom Maxi, $301.31. Such a gorgeous dress for spring! This dress will take you effortlessly from work to play and you won’t have to change a damn thing. With so many beautiful colors incorporated into the print of this dress, styling and wearing it will be a breeze. Mix this pretty frock with any color top layer to create a great all day look. Flats to the highest of platforms will work and wear as much or as little jewelry as you’d like because this dress can handle either end of the spectrum. Add a belt (try belting around your blazer/jacket or sweater to let the accessory pop a little more) and you’ve got yourself one amazing spring look. Yes, last minute happy hour plans don’t happen every day but it’s best to be prepared for when they do! If you know you’ve got plans after work then remember to make your outfit work for all portions of your day. If you’re plan-free or have a slight inkling that you may end up at the bar after work, it’s never a bad idea to pack a small bag for a quick outfit change before you head out. 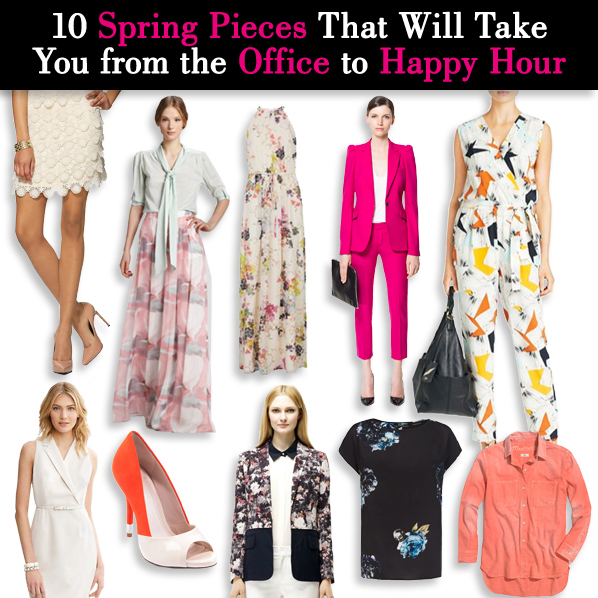 Regardless of what your after-work calendar looks like, any of these gorgeous pieces will get you spring ready and super stylish. Floral Dress uggghh! They look awesome. I have to look for my Cicihot florals in my closet again. 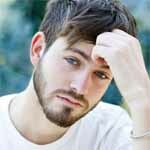 I want that look! Me too – that dress is so dreamy and definitely my favorite piece on the list! These pieces are great, I especially love the last maxi dress!